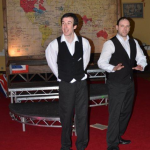 The Glencree Centre and Contemporary Christianity staged a production of the docudrama 1912: A hundred years on, at the National Museum of Ireland, Kildare Street, on 6 November. This production features the voices of Unionist people of the time who decided to sign the Solemn League and Covenant. 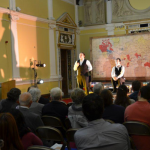 The play deals with the controversy surrounding the progress of the Third Home Rule Bill proposed by Asquith’s government in the Westminster Parliament. The drama includes the voices of Protestant clergymen who were concerned about the phrase, “using all means which may be found necessary”. The play is set in front of a map of the British Empire as it was in 1912 and helps the watcher identify with the events of the period. The Ceann Comhairle, Sean Barrett TD, opened the event, which was held in the Ceramic Room of the National Museum of Ireland. The drama was followed by a facilitated one hour discussion and dialogue among the invited audience of politicians and peacemakers. 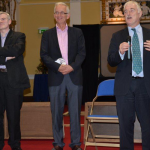 The Dublin presentation was the final night of the play which toured cities and towns, churches and community centres all over Northern Ireland during the preceding two months and earlier this year. 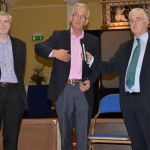 It was written by Philip Orr and Alan McGuckian SJ as a cross-community initiative and produced by Contemporary Christianity of Northern Ireland. Sponsorship came from a number of funders including the Community Relations Council (NI), the Lyric Theatre and the Reconciliation/Anti-Sectarian Fund of the Department of Foreign Affairs. 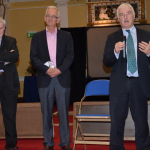 To watch extracts from the play, along with a short discussion by the writer Philip Orr, click here.